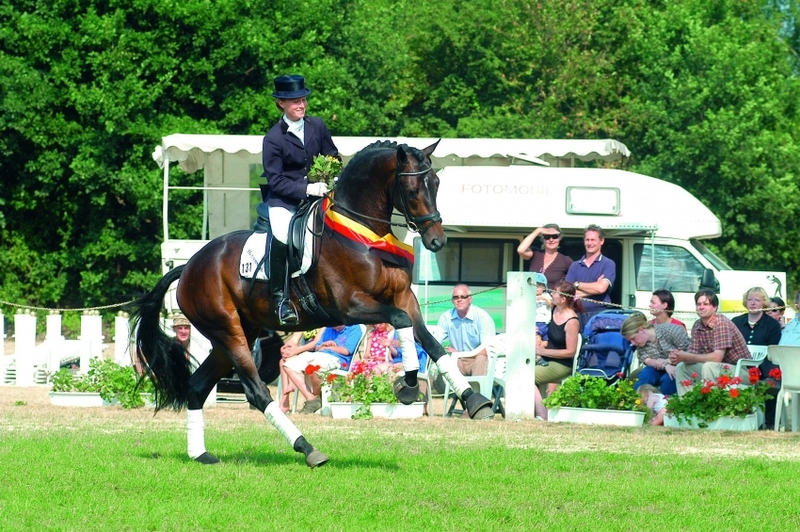 At his Trakehner Licensing, Herzensdieb was awarded Champion Stallion. “This stallion is not just moving, but dancing,” was the enthusiastic comment. Trakehner Verband Breeding Manager Lars Gehrmann added, “Endowed with the aura of something special, this stallion embodies the classical Trakehner upgrader type.” He was Reserve Champion of his 70-Day Test scoring above champions from Hanoverian, Oldenburg, Westfalen and Holsteiner licensings. 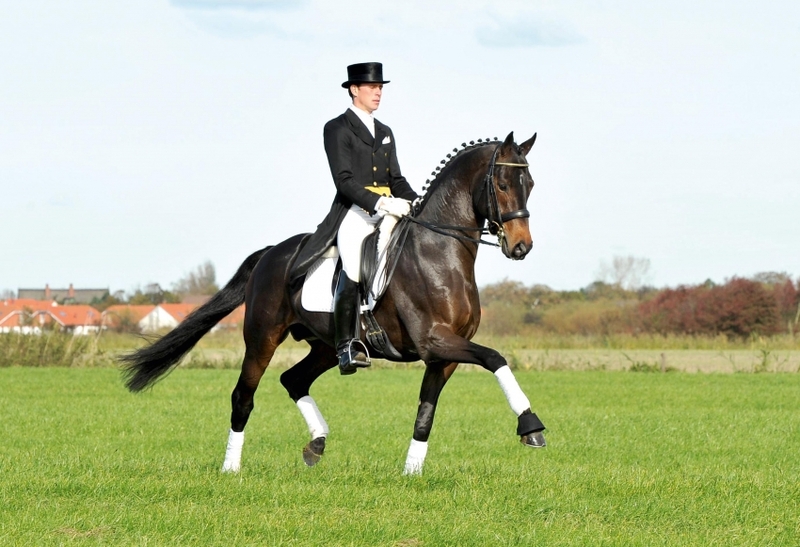 He won the Trakehner Championship for 3-year-old stallions, qualified for the Bundeschampionat for 6-year-old dressage horses and then trained up to the Advanced Level. Sire Tambour won his stallion licensing and was highly successful in both advanced level dressage and jumping. He then went on to become a successful sire producing auction horses, Premium mares and successful sport horses. Herzensdieb’s dam, St.Pr./El.St. Herzensfreude, scored 9.11 at her Mare Performance Test and was successful in dressage competition. 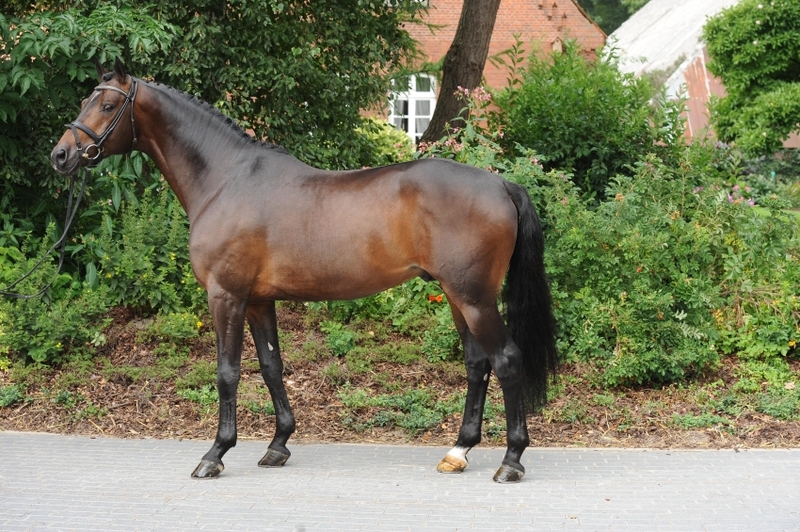 Granddam, SPS Herzenslust, Champion Mare in Schleswig-Holstein, won her Mare Performance Test. This noted damline has produced several licensed stallions, successful dressage horses and highly awarded mares. 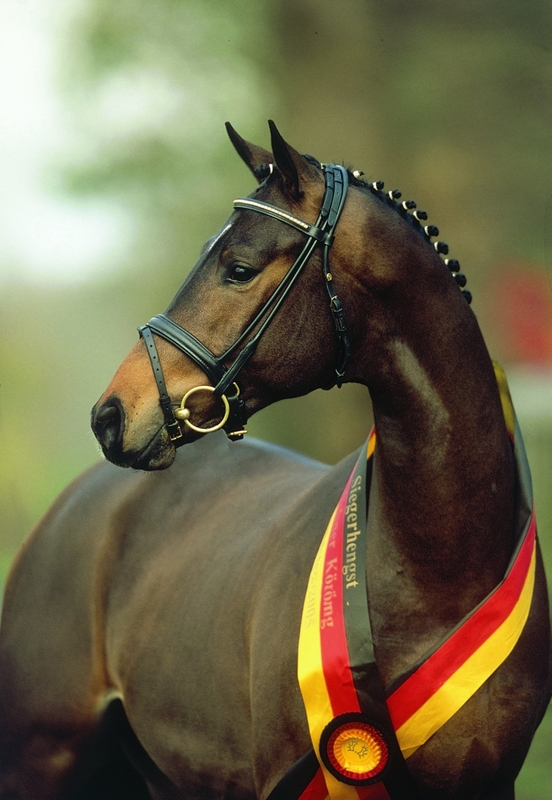 Herzensdieb has an FN breeding value dressage of 142 points and is in the top 10% of German dressage sires. He was honored with the prestigious Elite Hengst title (E.H.) by the Trakehner Verband. Herzensdieb stamps his offspring with his elegant type and exceptional rideability. Many daughters including Heartbreaker and Helmi have won honors at large mare shows throughout Germany. 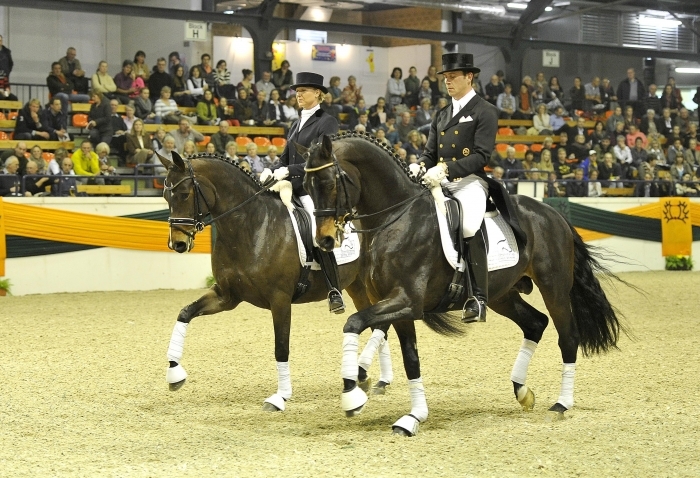 Daughter Elfenzauber qualified for the Bundeschampionat for 6-year-old dressage horses. He has two licensed sons; Herzenswunsch was 2012 Champion of Southern Germany, Horse of the Year in Berlin-Brandenburg and a multiple Bundeschampionat finalist. 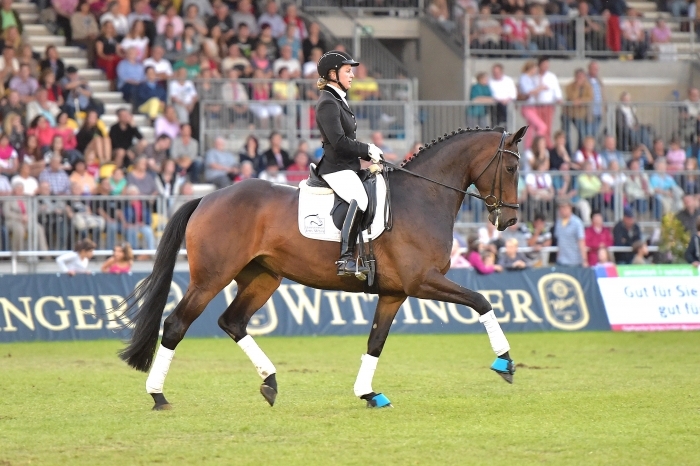 Hollywood with rider/trainer Helen Langenhanenberg won their S-Level debut (72.6%). 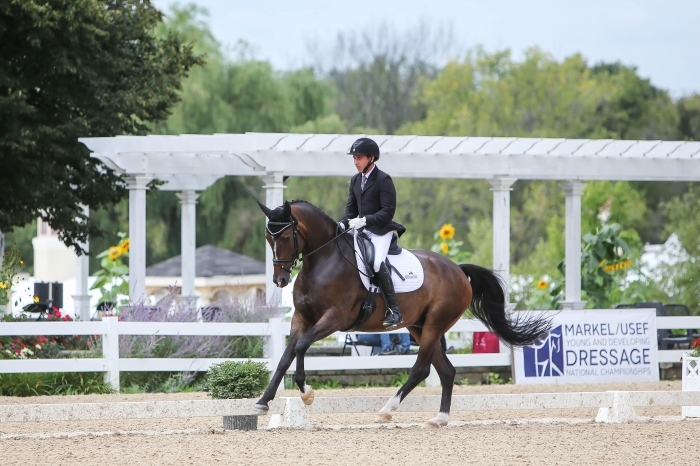 In the U.S., Hannigan L was the 2016 USDF Dressage Horse of the Year Reserve Champion at Second Level (74.086) and 2016 USDF Finals Second Level Open Champion (70.163). In 2017 he was the Second Level Open Champion at the USDF Finals (70.163). Owner Louise Leatherdale has been honored twice as USDF Dressage Breeder of the Year, 2016 and 2017. He is approved Trakehner, AHS, HV, ARS, GOV, Southern Germany, Danish and Swedish registries. Harriet, a lovely young dressage mare by E.H. Herzensdieb, has been highly praised for her rhythmic gaits, willingness to work, spirit and uphill gaits. She has also won classes in large mare shows and had a highly successful Mare Performance Test. Hannigan L (E.H. Herzensdieb-Pia Colada/Pik L) 2016 US Dressage Finals Second Level Open Champion & AHS Second Level USDF Open All Breeds Champion. I am interested in learning more about E.H. Herzensdieb.